-Wash chicken under running water, pat dry. -Mix half the ground spices with garlic, lemon juice and 2 tablespoon oil in a bowl. -Rub chicken inside out with the mixture, marinate for half an hour. -Heat ¼ cup oil in a large sautéing-pan over medium high heat, add onion. -Sauté onion, stir from time to time until for about 10 minutes or until translucent. -Stir in the rest of the ground spices, mix well. -Stuff the chicken with ¼ cup of the onion mixture, tie the legs and tuck the wings. -Stir the chicken with the rest of the onion over medium high heat, until golden brown. -Add water and let boil, reduce heat cover and simmer for about 45 minutes. -Lift the chicken and keep aside. -Drain rice and add to chicken broth, season with salt and whole spices, until boiling. -Reduce heat, cover and simmer for about 25 – 30 minutes. 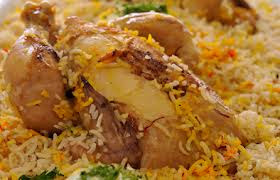 -Preheat oven to 180 degrees C.
-Sprinkle saffron mixture over rice. -Brush oven dish with the rest of the oil. -Spread a rice layer, put chicken and boiled eggs on top, cover with the rest of the rice. -Cover with foil lightly, bake for about 20 minutes. -Sprinkle with chopped coriander serve warm.